The blazer is a staple. For men, for women, for business, and yes...for casual as well. If they're not yet part of your casual repertoire, I can say with complete confidence that not only are you missing out on a great fashion statement, but as soon as you learn to wear it in the right way - as soon as you embrace the nonchalance of it, the elegance, the sass, the irony, the smoothness and complexity of it - your style status shall be elevated higher than you ever thought possible. Stick with me dear readers, as I am about to open your eyes - and expose your closets - to the mystique that is the Style Blazer. "How do they do this so flawlessly?" You might be asking yourself. "How do these people not look like they're going to sit at a desk in an office, but rather like they're going to sit front row at a runway show?" I will tell you. 1) The Style Blazer shall NEVER be worn closed. It is open, it is relaxed, it allows the public to see what is underneath, and if there is a monsoon it will blow freely in the wind. 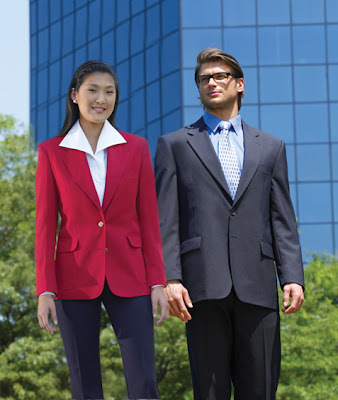 2) The Style Blazer most not be paired with plain/regular business slacks or a business skirt, or anything resembling the couple above. Cutoff shorts, high waisted pants, one pieces, bellbottoms, lycra miniskirts, cuffed pants with suspenders...heels, flats, high tops, orthopedic shoes, whatever! This is pleasure not business, please allow the Style Blazer some artistic breathing room for the magic to take place. 3) I demand that something to be different about this blazer. I don't care what it is. The buttons can be wooden, it can be bright pink, it can be satin, it can have patches, it can be seersucker or linen, it can have shoulderpads or have shoulder cutouts or have tassels hanging from the shoulders. Whatever it is I would like it to stand apart from other blazers in some way, even if it's only noticeable to you. 4) Experiment with size and tailoring. 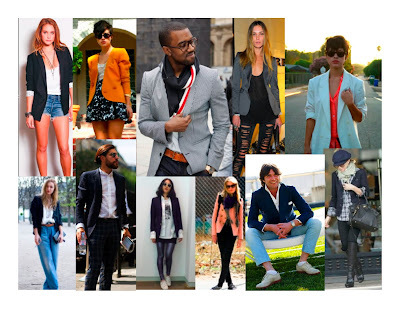 Long blazers and oversized blazers are huge right now on women (yeah pun intended, sue me). What does this mean? No, not that you go into your fat dad's closet, pull out his 56L jacket and slap it onto your size 6 frame. There are women's blazers specifically tailored to still fit a woman's body in the shoulders and sleeves - but they are extra roomy or long. For men, maybe try one that's tighter than you're used to. Man or woman, boy or girl, you shall find a Style Blazer that is well tailored and fits you like it's supposed to...there is no excuse for anything ill fitting or unflattering. 5) What goes underneath? Ah-HA...this is a good one. It is good because the idea is, that if you follow all the other rules, you can play with this one and try anything you want. Go super tight with a tube top or loosey goosey with and oversized vneck. Tuck the shirt in, wear it out, cut it up the center and tie it in a knot - plain, prints, loud or understated...just whatever you do MAKE SURE IT'S IN HARMONY WITH THE BLAZER. Sometimes the blazer can be the supporting actor, sometimes it's the star - so be clear about which it is when you're getting dressed, because nobody likes a fight for attention. And with these 5 simple steps my friends, we have taken the business out of the blazer. Walk tall, for you now have the knowledge that many don't, and this is a lesson you can't get anywhere - not from reading Vogue or GQ, not from your sorority sisters or frat fools, and certainly not in the business casual section at H&M. Happy shopping, happy dressing...godspeed.